Prescient's webinars help organizations realize the full potential of their intranets and websites by demonstrating industry trends and best practices, Intranet ROI, the benefits of incorporating social media into your intranet, and the positive impact a functional intranet can have on employee productivity. Our webinars are conducted monthly, and include a question and answer session at the end of the presentation, allowing you to voice any concerns or questions regarding your own organization's intranet or website. During our webinars, you can follow us on Twitter for links to articles and statistics that expand upon some of the topics brought up by the webinar's presenter or audience. After our webinars, your can view the slideshows on Prescient Digital Media's slideshare site or watch webinar videos by clicking on the links below. 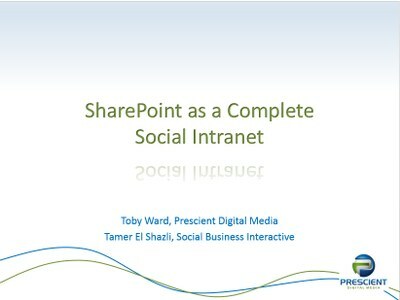 In this webinar Toby Ward of Prescient Digital Media and Tamer El Shazli of Social Business Interactive provide real world examples of social intranets created using nothing other than SharePoint. 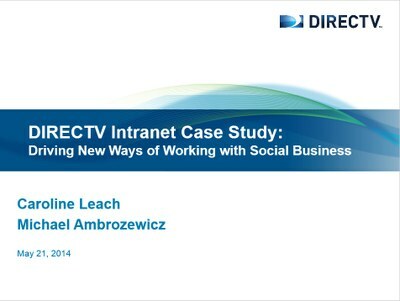 In this webinar Thyda Nhek & Michael Ambrozewicz share the lessons learned in building and rolling out a social intranet at DIRECTV. 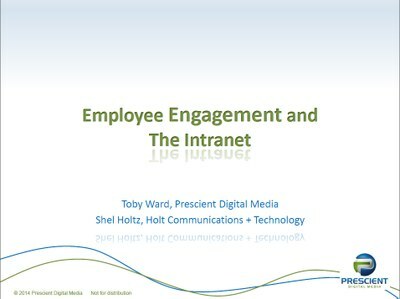 In this complimentary webinar, Toby Ward, CEO of Prescient Digital Media, and Shel Holtz, Principal at Holtz Communication + Technology discuss Employee Engagement & the Intranet. 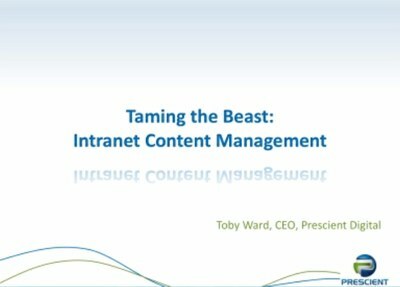 In this complimentary webinar, Toby Ward, CEO of Prescient Digital Media gives a behind-the-scenes look at the best intranets from the 4th Intranet Global Forum conference in LA. 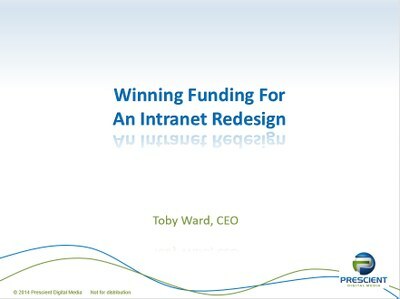 In this complimentary webinar Toby Ward, founder and CEO of Prescient Digital Media, discusses how to win funding for an intranet redesign and gain buy in from upper management. In this complimentary for Content management principles Toby Ward, founder and CEO of Prescient Digital Media discusses content management principles, rules for creating intranet content, writing for the intranet, empowering employees to create the RIGHT CONTENT, and the Dos and Don'ts for CMS's and SharePoint. In this complimentary webinar Tamer El Shazli, VP of Technology at Social Business Interactive, discusses the benefits the ways a social intranet can lift employee morale, increase productivity and decrease employee turnover. In this complimentary webinar, Toby Ward, CEO of Prescient Digital Media gives a behind-the-scenes look at the best intranets from the 3rd Intranet Global Forum conference in New York City. 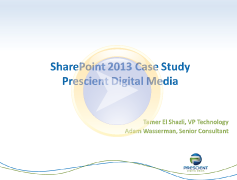 In this complimentary webinar, Tamer El Shazli, VP of Technology at Social Business Interactive discusses Content Migration for SharePoint 2013 and gives tips on vendors, tools, and strategies to help you find a migration solution. In this interactive webinar, Prescient showcases its new intranet built in SharePoint 2013 by Prescient's implementation division, Social Business Interactive. This webinar is a preview of the full presentation which will be delivered at the 2013 Intranet Global Forum. In this 45 minute webinar, Prescient's VP of Client Development, Chris Chambers, and VP of Technology, Tamer El Shazli, tackle all of your SharePoint 2013 questions. The webinar covers a wide range of topics related to SharePoint 2013 including content migration, template upgrading, backward compatibility, search and much more. 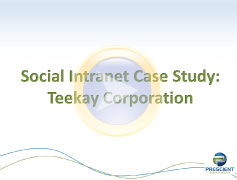 This complimentary webinar is an excellent opportunity to learn best practices from a case study based on the successes and challenges faced by Teekay Corporation during its recent intranet redevelopment project. In this webinar, Toby Ward, President and CEO of Prescient Digital Media describes our process for creating an intuitive, visually-appealing intranet design that employees will actually want to use. 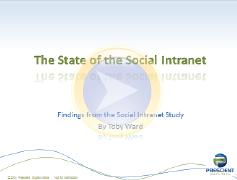 In this webinar, president and CEO Toby Ward examines the use of social media tools on corporate intranets. The webinar is based on a survey completed by 600+ organizations from around the world, providing some of the most current and comprehensive data on Intranet 2.0 tools. 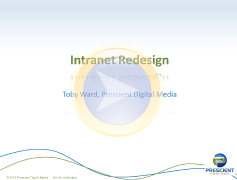 In this webinar, Prescient’s President and CEO Toby Ward discusses the secrets to convincing senior executives about the value of an intranet redesign.